Seven verses. They are recited by believers multiple times a day. They are said to be a summary of the meanings of the entire Qurʾan. But do you know what they really mean? Do you know why they are relevant to each of us all day, every day? Sura al-Fatiha – the Divine Opening – is the most important chapter of the Qurʾan. If you don’t know why, this course is where you can find out. “Indeed We have granted you [O Messenger] the Seven Frequently-Repeated [verses] and the Tremendous Recital.” (15:87) Experts in Qurʾanic commentary have explained that this verse is a reference to Sura al-Fatiha – due to it being repeated by believers multiple times a day in their prayers. They also say that the Tremendous Recital (al-Qurʾan al-ʿAẓīm) is also a reference to the same sura. Its greatness is such that Allah expressed what a great favor He had done to the Messenger of Allah, Allah bless him and give him peace, by referring to it with two great titles – as though each is a separate entity. Having a deep understanding of this sura is essential for those wishing to imbue their prayers with deep devotion and a sense of presence with their Lord. 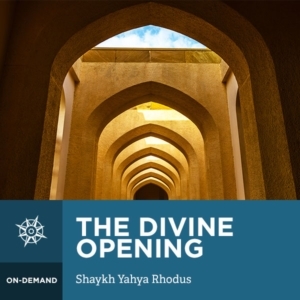 One of the names of the sura is “The instruction of how to ask.” In these lessons, Shaykh Yahya Rhodus beautifully explained the rich, nuanced meanings of this sura – connecting each point with the deeper meanings of living Islam and attaining closeness to Allah. It’s unmissable.